Beach Lane Books, 9781442441606, 40pp. In a sweet rhyming ode to unconditional love, debut author Kate Dopirak celebrates the silly ups and downs of life with a little one. Lesley Breen Withrow has been drawing for as long as she can remember. After graduating from college, Lesley worked as a graphic designer and then a creative planner and product designer for a greeting card company. Once completing a certificate in children’s book illustration from the Rhode Island School of Design, Lesley started her own illustration business. Lesley’s work can be seen on a range of products from books, apps, cards, gift wrap, scrapbooks, puzzles, stickers, magazines, packaging, toys, and games. Lesley lives in Rhode Island with her husband, young daughter, and sweet little black cat named Desi. 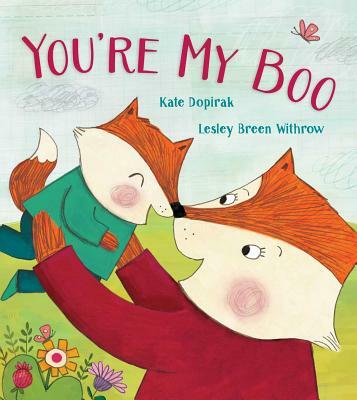 Though the title might suggest a hip, slangy ode to parental affection, Dopirak’s debut picture book takes a cuddlier approach as a mother fox describes her children in a series of rhyming terms of endearment: “You’re my peek-a-boo, my sneak-a-boo,/ my laughing-till-you-squeak-a-boo./ Go! Stop! Walk! Run!/ You’re my funny honey bun.” Working in a loose, cartoony style, newcomer Withrow uses rough strokes of pencil, vibrant collage elements, and digital coloring to create a friendly patchwork backdrop for the small domestic dramas that unfold over a single day. While these foxes have a happy home, it isn’t all smiles and giggles—there’s squabbling between the two siblings, a broken toy, and a tiny slip and fall, all of which are resolved with a bit of parental TLC. Dopirak’s rhymes...[are] unerring in their rhyme and meter and, along with Withrow’s tender illustrations, create a comforting mood from start to finish. Up to age 8. From morning to night, a mother fox loves her children, especially her oldest, her “Boo.” She gives him affectionate nicknames throughout the day as the kit and his younger sister eat, play, and squabble. Whether he’s nice or mean, happy or sad, Mom is always there to hug and snuggle her Boo. The rhyming text, printed in a large font and nicely laid out for reading aloud to children, bounces along merrily....The singsong text and spreads are interrupted by quartets of sequential actions punctuated with single-syllable words, “Yes! No! Nice! Mean!” These sequences show the siblings quarreling, after which their mother always reassures them that she loves them. Sometimes it seems as though the resolutions are glossed over. Thankfully, the illustrations, rendered in pencil and colored with hand-painted collage pieces and digital painting, provide more of a story arc, as well as family interactions for readers to explore and discuss. VERDICT An additional purchase for public libraries looking for more bedtime tales.